Print a range of products, from photographs, to business documents, to CD and DVD labels, with the Epson Artisan 1430 A3­-plus printer. Bright, vivid images are achieved with Claria Ultra High Definition Photographic ink, which is resistant to fading and provides a smooth, tonal gradation with fine detail. With Wi-­Fi connectivity, you can print direct from your camera, and the Micro Piezo print head produces ink droplets as small as 1.5 picolitres for precise definition. 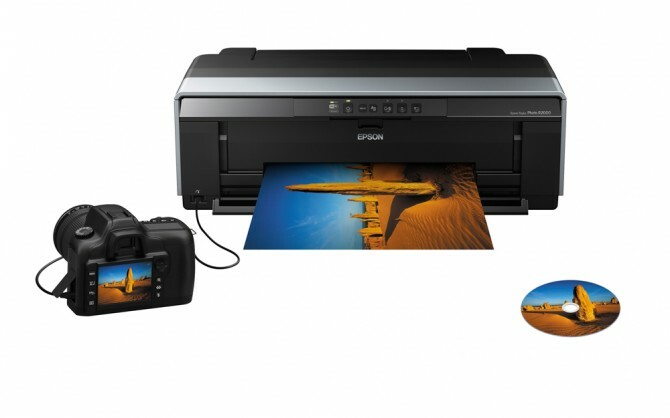 With an RRP of $549, visit epson.co.nz for more information. Setting the new standard in glossy printing, the Epson Stylus Photo R2000 A3­-plus printer offers the highest level of media versatility of any printer in its class. Explore all your creative aspirations and print on glossy, luster, matte, and fine-art papers with Epson UltraChrome Hi­-Gloss two-pigment ink. The R2000 delivers photos up to 13 inches wide and 44 inches long, and with wired and wireless networking included, allows you to print from anywhere. With an RRP of $1499, visit epson.co.nz for more information. The highly anticipated Epson SureColour SC­P800 — the newest addition to the SureColour range — is coming out soon. Specially designed for professional photographers, graphic artists, and designers, it delivers professional­-quality photographic and fine-art images in sizes up to A2 and larger using large, cost-effective ink cartridges. The SC­P800 combines the advanced Epson UltraChome HD pigment ink with the Micro Piezo print head — allowing for ink droplets as small as 1.5 picolitres — to enable exhibition­-quality colour prints with stunningly bright blues and violets, and gallery­-quality black-and-white output with deeper blacks and defined shadows. With the highest D­-max to date, high­resolution prints can be achieved on a wide variety of media types with an outstanding colour gamut for reliable quality. Featuring enhanced networking, easy media loading, and optional roll media support, the SC­P800 comes complete with a set of starter inks and an advanced software package. The new SC­P800 has an RRP of $2400. For more information visit epson.co.nz. Ideal for both amateur and semi­-professional photographers, the Epson SureColour SC­P600 delivers the highest D­-max to date and produces exceptional quality black-and-white photography, along with stunning colour exhibition­-quality prints. Using Epson UltraChrome HS pigment ink combined with the innovative Micro Piezo print head allows the SC­P600 to produce vivid colour prints with breathtaking blues and violets, as well as gallery­-quality black-and-white outputs. Features include A3­-plus–sized printing, high­-capacity cartridges, networking and wireless connectivity, plus advanced media handling. The new benchmark in professional photographic printing, the Epson SureColour SC­P600 is perfect for any business that has a regular requirement for high­-quality colour presentations. The SC­P600 has an RRP of $1899. Visit epson.co.nz for more information.